I know this doesn't happen very often, but I honestly don't have much to say today. There's really not anything exciting going on in my life to talk about (not like that's ever stopped me from rambling) at the moment. It's just been class, work, hanging out with friends, repeat. I'm still gearing up for graduation and the real world, but what else is new? I got my cap and gown the other day, and I'm still applying for jobs and not hearing back from anywhere. Same old. I'm convinced that one of these days, I'm just going to hear back from a bunch of employers at once who all want to hire me on the spot. It's going to happen. I wore this last week for class and coffee with friends, and while I wasn't crazy about this outfit at the time, it's growing on me. I haven't worn this scalloped dress in forever, mostly because it was traveling to and from Flock Together girls for most of last year. I loved all of the ways that styled it, but I saw it pop up in the blogosphere so much there for a while, that I wanted to wait until I showed it off again. Last week was apparently the time to re-introduce it to the world. Welcome back, dress. It's about time. As for my pop culture update (I always need one), I just started watching Orphan Black. Holy crap is it good. Tatiana Maslany is ridiculously talented and needs to be cast in everything immediately. What a lovely, feminine outfit) Your look is pretty good today) Those photographs are adorable as well:)! Such a god twist to have the lace overlay on that dress. You're totally gonna get hired by ALL THE PEOPLE because you are ALL THE CUTE and ALL THE THINGS! Yes, all of them. Don't fret. :D you're awesome! That scalloped green dress... oooohoohoooo that is beautiful. Green garments are so rare, I feel, and I love seeing them. I just know that you're going to get a ton of offers pouring in at once, and then the toughest thing you'll be facing is making a choice! I love the lace eyelet top you have layered over the dress.... how cute. Also, I'm a big fan of wishbone jewelry. I too have earrings and a necklace. Rock on sweet lady! That dress is so lovely - I can see why all the gals wanted a chance at styling it! Also, I feel you about the senior slump. I got my cap and gown the other day too - it was weird. Being a senior is just weird. Hang in there girl, almost at the end. 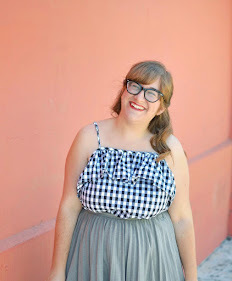 I love that scalloped hemline! I'm sorry to hear you haven't heard back about jobs yet! I'm sure you'll start to hear back the closer you get to graduating!